Mitigating risk isn’t easy, especially in light of government oversight from the Department of Justice, Securities and Exchange Commission, and Internal Revenue Service amongst others. In this day and age, it’s important to ensure your risk and compliance program has exceptional processes and procedures in place to better prepare for the future. 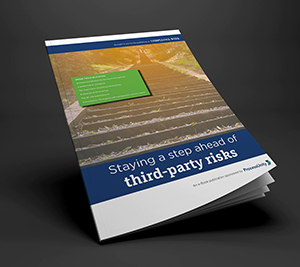 Produced by Compliance Week and sponsored by ProcessUnity, the Staying a Step Ahead of Third-Party Risk eBook explores what companies need to know to thwart third-party risk and stay off the regulatory radar. Make business justifications a regular part of the compliance process. Navigate corruption challenges from countries you operate in. Understand the importance of auditing third parties. Evaluate the risk of your third-party relationships. Prepare a comprehensive third-party risk questionnaire. Find the right third-party risk maturity model for you. Don’t miss this opportunity to stay ahead of third-party risk. To download your copy, please complete the form to the right.